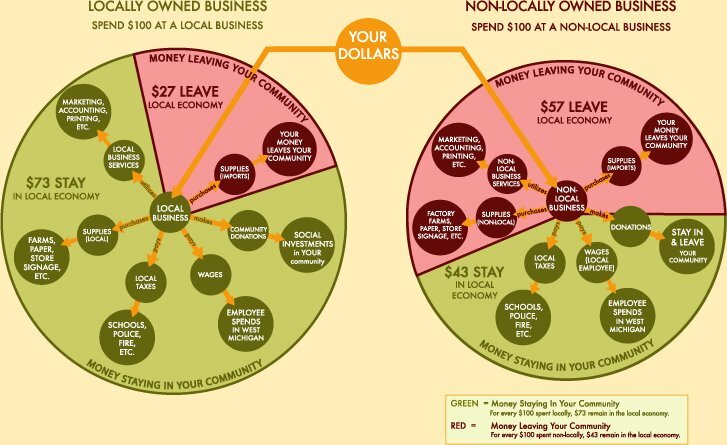 Very recently I came across a very interesting info-graphic on the Local First, a Michigan based organization that that encourages sustainable, locally-based economies. The graphic very effectively sheds more light on the effects of spending on a local business as compared to a non-local business. It appears that when you spend $100 on a local business, $73 remains in the local economy. Compare that to spending $100 on a non-local business, only $43 remains in the local economy. That’s as simple as it can be! I hope this encourages you to spend more dollar on locally owned businesses. 1. Significantly More Money Re-Circulates In Greater Grand Rapids. When you purchase at locally owned businesses rather than nationally owned, more money is kept in the community because locally-owned businesses often purchase from other local businesses, service providers and farms. Purchasing local helps grow other businesses as well as the Greater Grand Rapids tax base. The unique character of Grand Rapids is what brought us here and keeps us here. Our tourism businesses also benefit. Local businesses make more local purchases requiring less transportation and usually set up shop in town centers rather than on the fringe. This generally means contributing less to sprawl, congestion, habitat loss and pollution. 10. Investment In Greater Grand Rapids Is Encouraged. It’s a wonder this information is largely ignored. Or maybe it was overshadowed by National Chain advertising. Our community is sharply aware of the impact of dollars leaving our county. One by one our local stores are closing, too many local homes are past foreclosure and now sit vacant. What’s ironic is hoo-rah (made by some,) over the decision by the Largest Retail Chain In The World to open a SUPERSTORE at the southern end of our county. The Largest Retail Chain In The World already has a SUPERSTORE at the north end of our county. At least the guys on the bulldozers have a job for awhile.